This article. It needs to be updated to take into account the Warzone Firefight update and the accompanying Warzone boss refresh does not meet the wiki's general standards and/or standards on layouts. You can help by cleaning this article. It needs to be updated to take into account the Warzone Firefight update and the accompanying Warzone boss refresh. A game of Warzone in progress on the map Escape from ARC. Warzone is a multiplayer gametype introduced in Halo 5: Guardians. 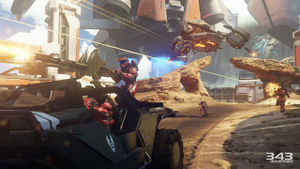 Warzone features large-scale combat with two teams of 12 Spartans facing off against each other on large maps populated by AI-controlled Covenant and Promethean enemies, including named boss units that occasionally appear on the battlefield. A team achieves victory by attaining 1000 points, which are gained by killing both enemy players and AI enemies, or by capturing all three bases on the map and destroying the enemy team's core, located in their base. In the beginning of a match both teams are dropped to their respective bases via Pelican and have to clear the base of AI enemies. A contingent of AI-controlled Marines aligned with either team is also stationed in each base. There are armories and garages on the map that can be captured by the players to give access to superior weapons and vehicles, respectively, and are part of the game's new Requisition system. The Requisitions available to the players are determined by their energy level, which is accrued over the course of the game, as well as the REQ cards they have purchased or earned by leveling up their Spartan Rank. The requisition packs allow players to respawn with a certain weapon or in a vehicle of their choosing, with a higher energy level providing access to more powerful items (although the player must also possess the REQ card for that item). Warzone is the only multiplayer mode in the game allowing the use of non-cosmetic Requisitions. Six maps supported Warzone at launch while another six will be available as DLC. Some of the maps built for Warzone have been said to be four times larger than those in prior Halo games. Warzone Promethean and Covenant enemies' difficulty is Heroic, but due to the great amount of players, their health and AI are improved, making them stronger than the standard Heroic ones. Warzone features two new spawning systems. The first system ensures players spawn on capturable Warzone Bases. This system uses spawn points placed in three groups called "rings". The first ring is made up of spawns placed inside the base. These are the highest priority spawns that are most commonly selected by the engine when the player selects the base as a spawn location. If there is combat inside the base, however, the engine will ignore spawns in the first ring and instead evaluate spawns in the second spawn ring. This second ring is comprised of spawns placed just outside the base. The third ring is the failsafe ring and contains spawn points significantly further away from the base. The spawn engine will only spawn players in the third ring if combat around the base is so chaotic that all spawn points in the other two rings are suppressed. The second system, called "bro spawing", finds groups of players using clustering analysis to understand who is working together as a team. Each set of players is then evaluated to determine if it's suitable to for a player to join by looking at a number of factors: confidence level in group directional heading, number of players in the cluster, combat status and enemy player presence. Once a compatible cluster has been identified, spawns are generated dynamically around that group. Warzone Assault is an asymmetrical 12 versus 12 base attack/defense scenario without AI enemies. In this variant, one team is tasked with defending the bases on the map while the other team attempts to capture each base and push the other team back. The defending team must hold each base until a set time limit runs out. If the attacking team manages to capture a base, they force the defending team back and extend the timer. If all bases are captured the attackers must assault the defenders' home base and destroy their core to win. Warzone Assault is conceptually very similar to the Invasion mode of Halo: Reach. Warzone Turbo is a gametype in which players automatically reach Level 9 after securing their Home Base. They obtain full access to their REQ inventory, with energy recharging significantly faster than usual, thus enabling the use of a myriad of REQ cards throughout the game. It is conceptually a mix of Fiesta and BTB Heavies. Originally the gametype was not intended for inclusion in matchmaking, as it was created for playtesting so that developers could efficiently test Warzone's features at any time during the game. However the developers decided to include it temporarily after recognizing it was an interesting concept. The weekend playlist "Weekend Warzone Turbo" has been added to matchmaking several times, usually around the release of a new content update. A game of Warzone Firefight on Escape from ARC. Warzone Firefight is a recreation of the Firefight gametype from Halo 3: ODST and Halo: Reach built on the Warzone game mode, and was released as part of the Warzone Firefight content update on June 29, 2016 while a public beta was available between April 14-19, 2016. Up to eight players work together to complete five rounds of increasingly difficult, dynamic objectives set against a timer. Warzone Firefight also includes a new tier of Mythic enemy bosses even more difficult to defeat than the Warden Eternal. Like Warzone and Warzone Assault players have full access to their REQ collection for use against enemies. Master Intex was a Legendary boss in a Phaeton that was featured in the E3 build of Escape From A.R.C. See List of REQ cards for a complete list. Warzone was originally going to feature ODSTs in drop pods. An early version of Warzone called Alamo. Concept art of a power core room in Warzone. Concept art of the garage structure. Concept art of a Warzone base structure. The beginning of a match. A Spartan engaging a Knight Marshal on Escape from ARC. Power weapons in the REQ terminal. Power weapons in the REQ terminal. Note how there are more listed. This may be because the player has unlocked more REQ cards, and thus the deck appears expanded. Vehicles in the REQ terminal. The end of a match. A Warzone Firefight Beta poster. A player using Dying Star in Warzone Firefight. A player earning points in Warzone Firefight. Progress of the round is kept in the bottom right hand corner. A round ends in Warzone Firfight. A player heads to defend a location from enemies in Warzone Firefight.